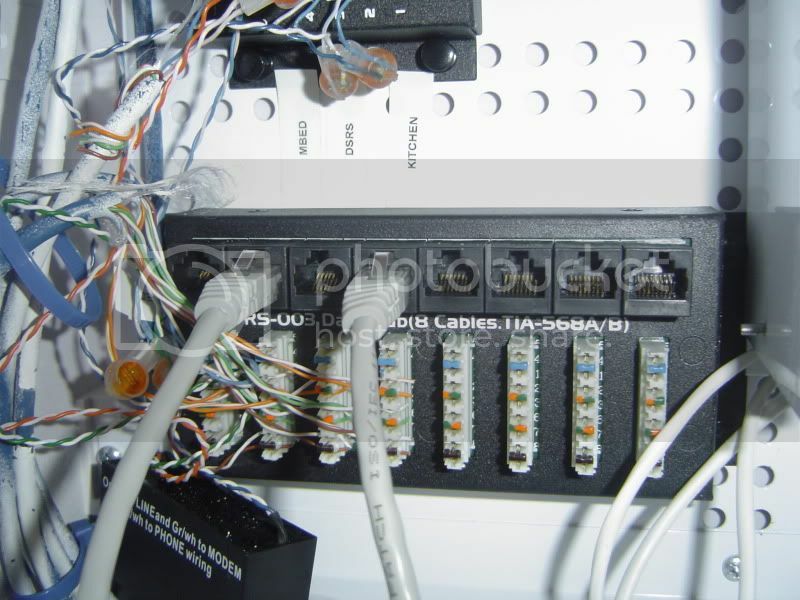 Forums › LAN (ethernet/Wifi/routers/Bluetooth) › New home cabling confusion!!! oh bugger, he hasn't terminated all 4 pairs so you won't get a gigabit connection. still looks messy to me! sorry!!!! Geez thats still pretty bad as far as wiring goes. Supposed to maintain the twist as close to the termination blocks as possible. Also, all 4 pairs are supposed to be punched down (whats happened to the blue pair? Unless I am not understanding what is going on here). The lack of twist + the missing blue pair will consign you to 10/100 speeds. As you have demonstrated, by connecting directly to the switch you get 1000 (as you are bypassing the bad wiring). JimmyLizar: whats happened to the blue pair? JimmyLizar: (whats happened to the blue pair? i think he's punched the blue pair up on the voice block so he's sending voice down the blue pair?? That is shocking work, and yes it would appear that he has piped either voice or DSL to each room, presumably the DSL to the downstairs office. If you want GigE then you will need to have it fully wired, and the pair twists kept a close as possible, and reduce the amount of unsheathed cable as much as possible, although this is not too much of an issue. 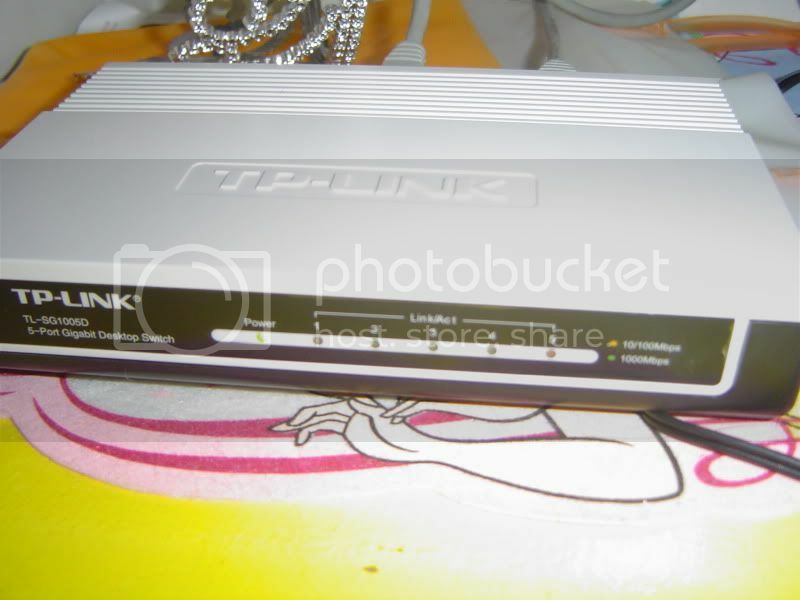 If you want GigE you need all 4 pairs and thus you will also need to site the router at the hub, as you seem to get good wireless coverage thought out the house then siting it in the hub may not be as bad as you think. Using a single run for two services (ethernet and voice or even DSL as well) is ok, but to do it by seperating out pairs within the permanent wiring is not a good idea. 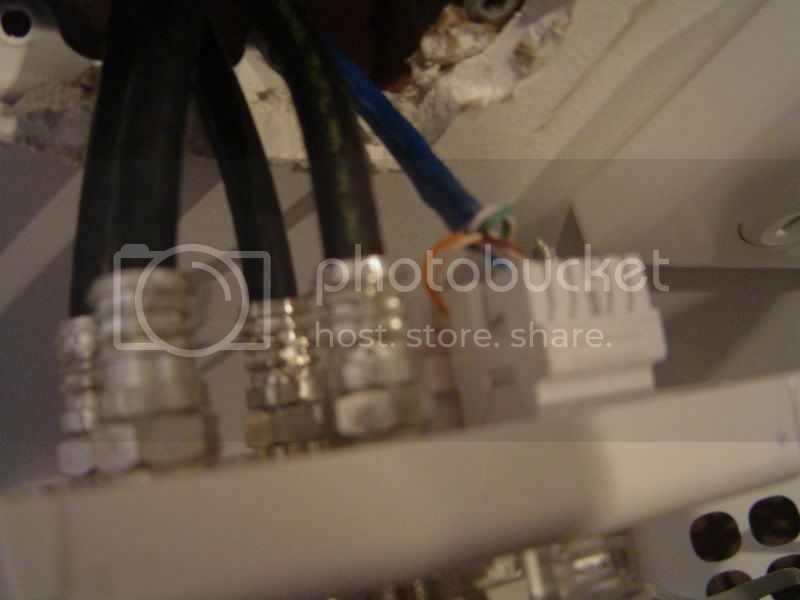 Its better to provide the permanant wiring (patch panel socket to room TO) as fully wired, then use the correct splitters at each end to split the services should you want. This way you dont need tools to do changes, you always have fully wired permanent wiring, and it clearly plain to see why and what you have, not hidden within the wall. I repeat my previous comment, dont bother getting this monkey back, he plainly has no idea, and the work of his repeat visit only goes to reinforce this. 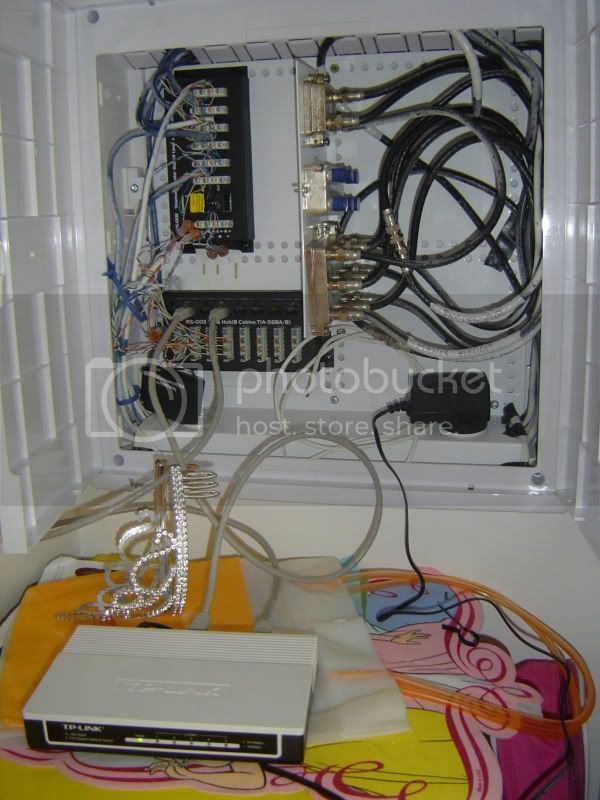 I would also be very concerned as to why one circuit is only providing 10Mb/s, this I suggest is a result of too much untwist at either the patch panel or TO, and looking at these pictures its not hard to imagine that he stuffed the TOs too. Honetly that is so poor, sadly we have no rules or body to report such poor work like this, one advantage of the Aussie setup. Why has he not trimmed the wires on the TO, this will cause massive impedance mismatching, and the twist is totally gone, no wonder it does not pass even 100Mb/s on some ports. You need to get someone other than this monkey to sort it out, maybe a slab of beer for coffeebaron. I think he does, just hope all the spare cable slack has not be cut away leaving you a awkward job. 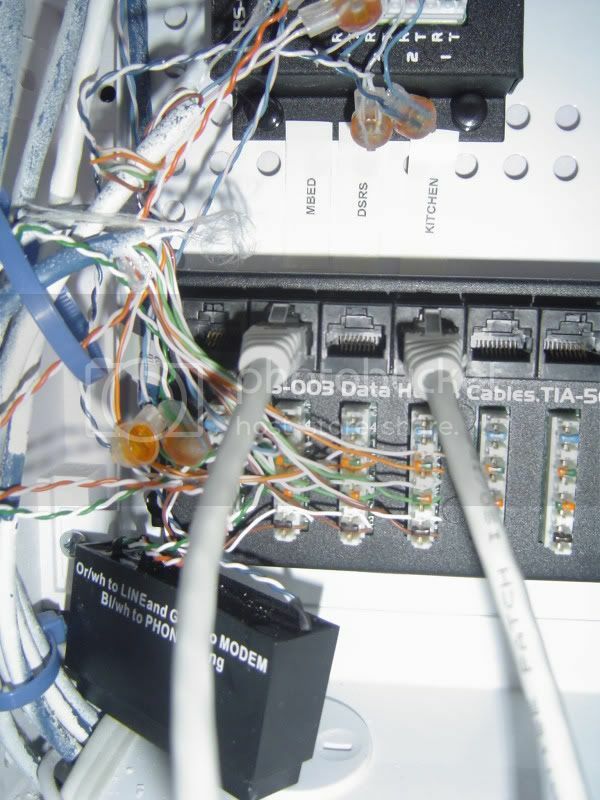 The other issue too, is I think all the RJ45 jacks are pretty much 1 feed each; so if you do want phone & data at the same place, then you need to split it. All four pairs should of course still be wired, and a splitter used at each end. For a new home, surely at-least two cable runs to each socket is the minimum. Honestly? I would love you to come out and SHOULD have!! I just felt the guy who originally did this all SHOULD fix it, the only reason why I got him instead of you coffeebaron. cyril7: I think he does, just hope all the spare cable slack has not be cut away leaving you a awkward job. Yes, I noticed this was going to be an issue from the start. Now its worse.